Blink 182 will be hitting the road this summer with special guests Fall Out Boy and Weezer. Mark Hoppus has posted their most recent set list that they are working on for the tour, check that out below. 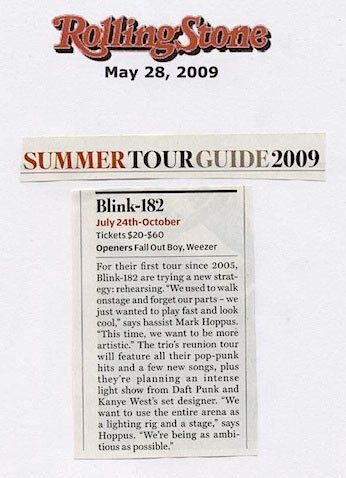 A clipping from Rolling Stone about the bands upcoming tour can also be seen below. Pledge to Volunteer and be entered for a chance to win free tickets to see blink this summer. Stop by thevoluntour.org and check out the list of other shows we are waiting to give tickets away to!